Superbly located in the heart of the Theatre District, the landmark AKA Times Square, originally known as the Hotel Gerard, was designed by famed architect George Keister in 1893. It features a storied past, reflecting the changing times of New York City. The brick, limestone, and terra-cotta Romanesque Revival building was landmarked in 1982 by the New York Landmarks Preservation Commission. The committee noted that the "handsome facade with carefully executed brickwork and curving bays and the striking gables and dormers make the Gerard among the prominent buildings of the theater district." It was added to the National Register of Historic Places on February 10, 1983. Respectfully updated in 2007 by a team of top architects, AKA Times Square features a collection of 105 hotel residences - sophisticated studios, one and two bedroom suites (some with dens), and stunning penthouse suites - ideal for stays of a day, week, or month. Its residents enjoy premium hotel services and amenities, including a fitness center, complimentary WiFi, business center, concierge services, and dry cleaning services. The new and breathtaking bi-level penthouse amenity space, a.lounge, was created by renowned international designer and architect, Piero Lissoni, and his U.S. design firm, BY Lissoni. Here, residents can socialize, hold impromptu meetings, or catch up on email. Steps from iconic attractions such as the Theatre District’s many world-class Broadway shows, Bryant Park, Radio City Music Hall, Rockefeller Center, world-class dining, and eclectic shopping, AKA Times Square reflects the vibrant energy of New York City while providing guests with a quiet respite - the best of both worlds. Additionally, the Times Square transportation hub, one block away, provides convenient access to any destination in the city. 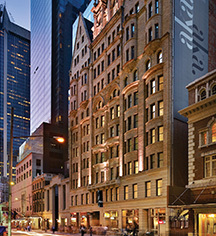 AKA Times Square, a member of Historic Hotels Worldwide since 2016, dates back to 1893. Previously known as Hotel Gerard, it was a favorite spot for several theatre celebrities in the 1920s, including actors Albert Phillips, Arthur Burckly, character actress Josephine Williams, and playwright Augustin MacHugh. Cancellation Policy: Prior to arrival: 3 days for 1-6 nights, 7 days for 7-29 nights, 15 days for 30 nights or longer. Cribs and Pack-in-Plays: Cribs available at $50 per night. Rollaways: Available at $50 per night. Parking: Parking garage across street at $35 for 24 hours. Payment:All major credit cards, travelers checks, money orders are accepted. Superbly located in the heart of the Theatre District, the landmark AKA Times Square, originally known as the Hotel Gerard, was designed by famed architect George Keister in 1893. It features a storied past, reflecting the changing times of New York City. Learn more about the History of AKA Times Square .